Italian sculptor. He began his career in Giovanni Battista Foggini s studio in Florence. From 1681 to 1686 he studied at the Accademia Fiorentina in Rome under Ercole Ferrata and Ciro Ferri. In 1685, with fellow students Giovanni Camillo Cateni, Francesco Ciaminghi (d. 1736) and Antonio Francesco Andreozzi (1663-1730), he executed roundel reliefs in glazed terracotta of the Stations of the Cross from designs by Ferri commissioned by Cosimo III, in the convent church of S Pietro dAlcantara in Montelupo, his contribution being the Deposition, Entombment (Montelupo, SS Quirico e Lucia all Ambrogiana) and Flagellation (private collection). The last of these is particularly instructive, because Ferris wax model for it still survives (Staatliche Museen, Berlin). 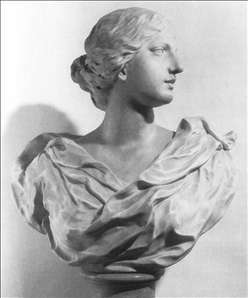 See more details about "Bust of a woman"